Leo Ernest Durocher (July 27, 1905 – October 7, 1991), nicknamed Leo the Lip, was an American professional baseball player and manager. He played in Major League Baseball as an infielder. Upon his retirement, he ranked fifth all-time among managers with 2,009 career victories, second only to John McGraw in National League history. Durocher still ranks tenth in career wins by a manager. A controversial and outspoken character, Durocher had a stormy career dogged by clashes with authority, umpires (his 95 career ejections as a manager trailed only McGraw when he retired, and still rank fourth on the all-time list), and the press. Leo Durocher was born in West Springfield, Massachusetts on July 27, 1905, the youngest of four sons born to French Canadian parents. He was educated locally and became a prominent semi-professional athlete, with several employers competing to have him play on their company teams. After being scouted by the New York Yankees, he broke into professional baseball with their Hartford team of the Eastern League in 1925. He was called up to the Yankees and played in two games. Durocher spent two more seasons in the minors, playing for Atlanta of the Southern Association in 1926 and St. Paul of the American Association in 1927. 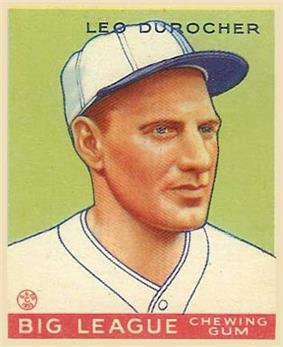 Durocher 1933 Goudey baseball card. He rejoined the Yankees in 1928. A regular, if unspectacular, player, he was nicknamed "The All-American Out" by Babe Ruth. Durocher was a favorite of Yankee manager Miller Huggins, who saw in him the seeds of a great manager—the competitiveness, the passion, the ego, the facility for remembering situations. Durocher's outspokenness did not endear him to Yankee ownership, however, and his habit of passing bad checks to finance his expensive tastes in clothes and nightlife annoyed Yankee general manager Ed Barrow. Durocher helped the team win their second consecutive World Series title in 1928. He demanded a raise and he was sold to the Cincinnati Reds in 1930. Durocher spent the remainder of his professional career in the National League. After three years with the Cincinnati Reds, he was traded to the St. Louis Cardinals in mid-1933. Upon joining the Cardinals he was assigned uniform number 2, which he wore for the rest of his career, as player, coach and manager. That team, whose famous nickname "Gashouse Gang" was supposedly inspired by Leo, were a far more appropriate match for him; in St. Louis, Durocher's characteristics as a fiery player and vicious bench jockey were given full rein. Durocher remained with the Cardinals through the 1937 season, captaining the team and winning the 1934 World Series (their third title in nine years) before being traded to the Brooklyn Dodgers. Primarily a shortstop, Durocher played through 1945, though his last year as a regular was 1939; after that year he never played more than 42 games in a season. He was known as a solid fielder but a poor hitter. In 5,350 career at bats, he batted .247, hit 24 home runs and had 567 runs batted in. He was named to the NL's All-Star team three times, once with St. Louis and twice with the Dodgers. In 1938 he made history of a sort by making the final out in Johnny Vander Meer's second consecutive no-hitter. 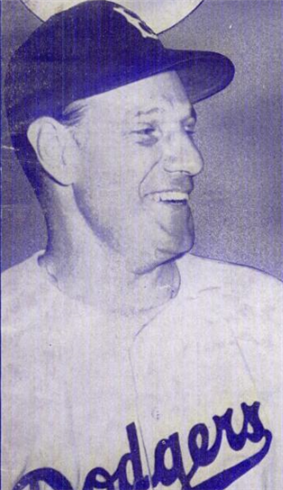 After the 1938 season—Durocher's first year as Brooklyn's starting shortstop—he was appointed player-manager by the Dodgers' new president and general manager, Larry MacPhail. The two were a successful and combustible combination. MacPhail spared no expense in purchasing and trading for useful players (and sometimes outright stars), such as Dolph Camilli, Billy Herman and Kirby Higbe. He also purchased shortstop Pee Wee Reese from the Boston Red Sox, who impressed Durocher enough that he gave up his spot as the regular shortstop so Reese could get a chance to play. Other major purchases by MacPhail included another young star, Pete Reiser, when he was ruled a free agent from the Cardinals' farm system; and MacPhail found stalwarts such as American League veterans Dixie Walker and Whitlow Wyatt off the waiver wire. "He can't hit, he can't field, he can't run. All he can do is beat you." Despite all the success of his first three years, Durocher and general manager Larry MacPhail had a tempestuous relationship. MacPhail was a notorious drinker, and he was as hot-tempered as his manager. He often would fire Durocher in the midst of a night of drinking. The following morning, however, MacPhail inevitably would hire Durocher back. Finally, at the end of the 1942 season MacPhail's time with the Dodgers came to an end when he resigned to rejoin the United States Army. His replacement, former Cardinal boss Branch Rickey, retained Durocher as skipper. Durocher managed the Dodgers continuously through 1946 (having ceased as a player during 1945 season), and he led Brooklyn to the first postseason NL playoff series in history, where they lost to the Cardinals, two games to none. Durocher also clashed regularly with Commissioner Bugsy Siegel. ^ "French-Canadian Americans – History, New france, SETTLEMENTS OUTSIDE QUĂ‰BEC". Everyculture.com. Retrieved December 3, 2013. ^ "Leo Durocher Baseball Stats, facts, biography, images and video.". The Baseball Page. Retrieved December 3, 2013. ^ Banks, Kerry (2010). "Baseball’s Top 100: The Game’s Greatest Records". Vancouver, BC: Greystone Books. p. 55. ^ a b c d e "Leo Durocher". Baseball Reference. Sports Reference. Retrieved 25 September 2015. ^ Robinson, Ray (April 4, 1993). "A Bad Guy Who Finished First". The New York Times. ^ "Mister Ed: Season 4, Episode 1 : Leo Durocher Meets Mister Ed". IMDb.com. Retrieved December 3, 2013. ^ Munzel, Edgar. "Bruins Give 3-Year Pact to Durocher." The Sporting News, 1965-11-06. ^ "The 1969 Chicago Cubs Game Log". Retrosheet.org. Retrieved December 3, 2013. ^ Markus, Robert. "Feisty Baseball Legend Leo Durocher Dead At 86: Ex-player, Manager Lived Life On Own Terms," Chicago Tribune (October 8, 1991). In the 2013 film 42, Durocher is played by Christopher Meloni. With Day he had two adopted children, daughter Melinda Michele (1944-2012) and son Chris (born 1945). With Ruby Harley, Durocher had a daughter named Barbara. Durocher was married four times. He was married to Ruby Harley from 1930 to 1934. He was married to St. Louis socialite Grace Dozier from 1934 to 1943. In 1948 he married actress Laraine Day, and they divorced in 1960. His fourth wife was Lynne Walker Goldblatt, to whom he was married from 1969 to 1980. Durocher finished his managerial career with a 2008–1709 record for a .540 winning percentage. He posted a winning record with each of the four teams he led, and was the first manager to win 500 games with three different clubs. Durocher managed the Houston Astros for the final 31 games of the 1972 season and the entire 1973 season before retiring. While with the Cubs, Durocher encountered a difficult dilemma in regard to aging superstar Ernie Banks. While Banks' bad knees made him a liability, his legendary status made benching him impossible. Durocher also nearly came to blows with Cubs star Ron Santo during an infamous clubhouse near-riot. The problems were symbolic of Durocher's difficulty in managing the new breed of wealthier, more outspoken players who had come up during his long career. He was fired midway through the 1972 season, later stating that his greatest regret in baseball was not being able to win a pennant for longtime Cubs owner P.K. Wrigley. '"No," Durocher answered, "those are the real Mets." At the same press conference, Durocher declared, "I am not the manager of an eighth place team." He was right; the Cubs finished tenth in his first season, becoming the first team to finish behind the previously hapless New York Mets. In 1967, however, the Cubs started strongly and had only their second winning season since 1946. The team steadily improved, but in 1969, Durocher suffered one of his most remembered failures. The Cubs started the season on a tear, and led the newly created National League East for 105 days. By mid-August they had a seemingly insurmountable 8½-game cushion, and they appeared to be a shoo-in for their first postseason appearance in 25 years. However, they floundered down the stretch, and finished eight games behind the "Miracle Mets" (who were 9½ games back in mid-August). During this period, Durocher, who had made his screen debut in the 1943 Red Skelton comedy Whistling in Brooklyn, played himself in several television shows. In an April 10, 1963 airing of The Beverly Hillbillies, Durocher plays golf with Jed Clampett (Buddy Ebsen) and Jethro Bodine (Max Baer, Jr.), and he tries to sign Jethro to a baseball contract after discovering Jethro has a strong pitching arm. In a memorable episode of The Munsters, entitled "Herman the Rookie" on April 8, 1965, Durocher believes Herman (Fred Gwynne) is the next Mickey Mantle when he sees the towering Munster hit long home runs. Football great Elroy Hirsch also appeared with Durocher. Three years earlier, he also appeared as himself in an episode of Mr. Ed, when the talking horse gave batting tips to the Los Angeles Dodgers, helping them win the pennant. Durocher also appeared on television in the early 1950s on the syndicated What's My Line? as a mystery guest. (May 31, 1953). After leaving the Giants following the 1955 season, Durocher worked at NBC, where he was a color commentator on the Major League Baseball on NBC and host of The NBC Comedy Hour and Jackpot Bowling. He later served as a coach for the Dodgers, by then relocated to Los Angeles, California, from 1961 to 1964. 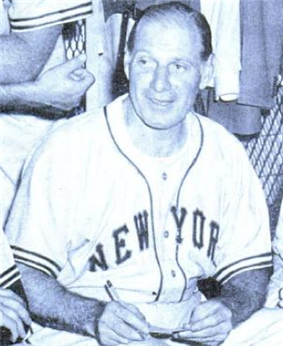 Durocher with the Giants in 1948. Durocher in the dressing room of Delorimier Stadium in Montreal in July 1946. During spring training 1947, Durocher became involved in an unseemly feud with the new Yankee owner, Larry MacPhail. The Yankee boss had hired away two coaches from Durocher's 1946 staff (Chuck Dressen and Red Corriden) during the off-season, causing friction. Then matters got worse. Durocher recounts his recollection and interpretation in his autobiography, Nice Guys Finish Last (1975). The actual quotations (recollected 29 years after the fact) are incorrect, as they are contradicted by the contemporary records (see references above), but show Durocher's philosophy, as epitomized in this maxim of his. The saying "nice guys finish last" is a condensation by journalists of a quotation by Durocher—he did not originally say this form himself, though it has often been attributed to him, and he did appropriate it as his own. The original quotation was “The nice guys are all over there, in seventh place.” (July 6, 1946), about the 1946 New York Giants—seventh place was next to last place in the National League. This was shortly afterwards rendered as “‘Nice Guys’ Wind Up in Last Place, Scoffs Lippy”, thence its present form. Durocher is also credited with popularizing the metaphorical use of the phrase "capture lightning in a bottle" in a baseball context—it had previously been used to literally refer to Benjamin Franklin's kite experiment.